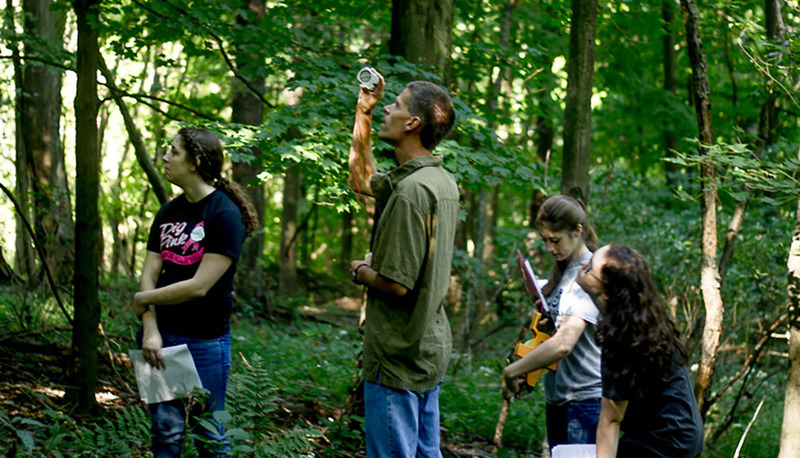 Opdyke and his botany students assess forest health and carbon sequestration at Lowries Run Slopes in Pittsburgh. Associate Professor of Environmental Science Matthew Opdyke, Ph.D., discussed his research on Pennsylvania's lichens Feb. 3 with employees of Fern Hollow Nature Center and the Pittsburgh Botanic Garden, as well as Quaker Valley High School students from the QV Creekers Club. The QV Creekers Club is part of Creek Connections, which provides educational opportunities for high school students in the region to learn about the environment and participate in research. Club members chose lichens as their topic for research this year and invited Opdyke to introduce them to lichens and help them plan their research at Sewickley Heights Borough Park. "Lichens are an important bioindicator of air quality, and given the long history of air pollution in the region, studying lichens can tell us how we relate to other urban areas," Opdyke explained. In addition to air quality, lichens can be used to assess habitat alteraton, urbanizaton and road traffic. "We are approaching 10 years from the last time we surveyed lichens in the region so we will be surveying them again at the same sampling sites to determine if there has been any changes in lichen communities," he added. Opdyke teaches courses in Point Park University's Bachelor of Science in biological sciences and Master of Science in environmental studies programs. Learn about how Opdyke involves Point Park University students with his environmental science research.